The first step is to determine when they should shut down their pond equipment: the pump, filter and UV clarifier. If your winter temperatures are moderate, you may continue to run their pumps to keep the pond surface from freezing. Further north, where temperatures are more extreme, you’ll want to recommended shutting the pond down for two reasons. First, the pump will mix colder surface water with the slightly warmer, more stable temperatures in the pond bottom where fish take comfort and hibernate. Second, pond owners risk the chance of diverting water out of the pond and emptying it when the flowing water begins to form ice, especially on features like waterfalls or streams. Recommend that you store the equipment indoors safe from the elements. It’s also a good idea to clean and inspect the equipment and replace any broken components. When shutting down the pumps, filters or any other equipment remind your friends if they are storing the equipment outside or in an unheated space make sure that there is no water left in the device that may ice up and cause the body/housing to break. If kept inside it helps to place the pump, if it is submersible, in a bucket of water to keep the moving parts and seals wet. designed to keep an area of the pond ice-free during the winter, allowing harmful gases to escape through the opening. In small ponds, a de-icer is especially helpful in preventing ponds from freezing solid. For fish safety, it is extremely important to never break ice on the pond because the shock waves can be detrimental, and sometimes fatal, to fish. There are energy conserving de-icers designed specifically for ponds that are inexpensive to run. As an alternative, you can advise them to melt a hole daily by setting a heated pan of warm water on the surface. Either method of creating an ice-free opening will let pond inhabitants breathe, maintaining their health and longevity. Remember, winter can be stressful on a fish’s immune system. De-icer’s alleviate stress during the winter, making it easier for them to withstand diseases that are more prevalent in the spring. In most parts of the United States it’s best to leave fish in the pond during the winter, providing the depth of the pond is adequate (18˝ or deeper) and there is little or no water circulation. The denser, warmer water will sink to the bottom of the pond, where it will be insulated by the cooler surface water or ice, and fish will gather in this deep, warm area. It’s important to advise your customers, however, that some types of fish, such as fancy goldfish with ornate tails, bubble eyes and lion heads, are sensitive to cold weather and should be brought indoors. As winter approaches, people should monitor pond water temperatures daily. 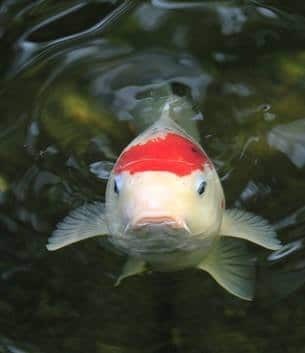 When the water temperature falls below 39°F (editors note: many koi keepers stop feeding koi when water temperatures fall below 50°F), you should stop feeding the fish altogether. 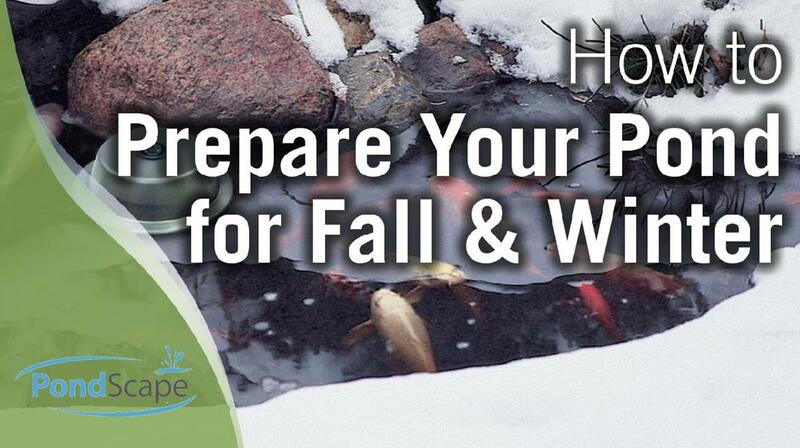 First-time pond owners may worry about not feeding their fish, but you can assure them that their fish will naturally rely on stored energy reserves to sustain them throughout the winter months. Remember to go through this checklist with your pond customers. Taking these few steps now will ensure their fish will survive the winter and they are sure to enjoy a successful pond season next year. • Purchase or have the pond de-icer ready for installation (in northern climates in risk of ponds freezing over). It will melt a small opening in the surface, allowing noxious gasses to escape.